After travelling 13 140 km by ship from Spain, Volkswagen Group South Africa’s (VWSA) new try-out press arrived in the Uitenhage factory recently. VWSA has invested R120 million in a new 21 000 kN (kilo Newton) Try-out Press to improve the manufacturing capability of its Uitenhage Plant. The new press will be used to ensure that the tools are pressing the vehicle sheet metal parts according to the required quality standards prior to going into production. This ensures that the currently installed presses are used solely for production thus improving the productivity of the press plant. It will also be used in tool maintenance and implementing engineering changes on the current series production press tools. “The press design and kinematics of this new press are comparable to that of the equivalent production draw press. It will therefore be able to accurately reproduce the line conditions and deliver the same quality of parts off-line,” said Thomas Schaefer VWSA Chairman and Managing Director. 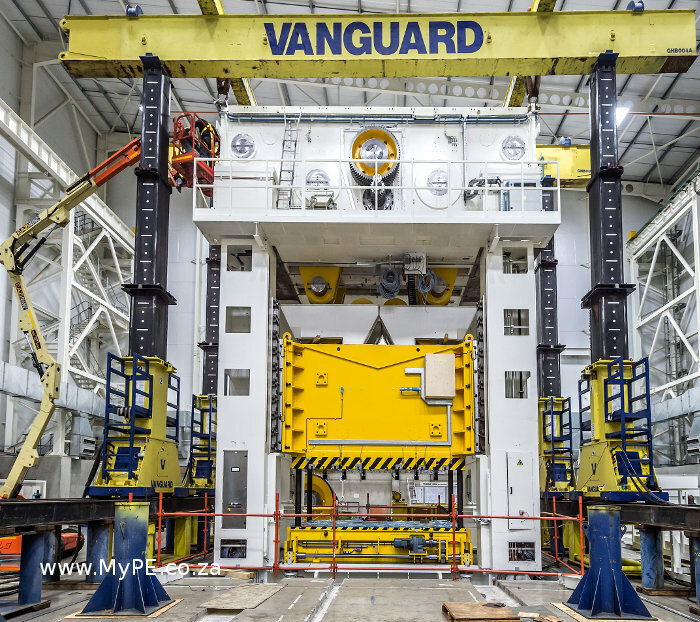 Once fully assembled, the new press will weigh approximately 600 tons and will deliver a maximum force of 2 100 tons, equivalent in weight to 306 male African elephants. The heaviest single lift in the initial stages of the project was the press bed at 120 tons, however, this was eclipsed later by the press crown which weighed in at 220 tons and was lifted 8 metres above floor level and mounted on top of the press columns. “Our Uitenhage plant has one of the newest press plants in South Africa and in the Volkswagen Group. The Press Plant was commissioned in 2013 and is capable of producing close to 10 000 parts per day for the Polo, Cross Polo and local Polo Vivo models,” concluded Schaefer. The Try-Out Press is expected to be fully operational by mid-2016. Next: Unlocking potential synergies between Jacksonville, Florida and Nelson Mandela Bay.